So a while back, we bought this lovely salt grinder (you see to the left in the picture.) Since then, we have been buying salt in its rocky form that we can grind down fresh at the table. Somewhere along the journey of life, my mom bought me some Himalayan pink salt as a gift. I really liked the salt. Sure, I had herd some whisperings that there were actual health benefits to the pink salt, but mostly I enjoyed it because it was pink. Who doesn't like pretty stuff, right?? Ever since then, when I come across the salt, I buy it. It's lovely--as I am sure that you can agree--and makes for a great display salt in my salt grinder. It's that same salt those salt lamps are made out of...and they say that it's great for you from a health stand-point. 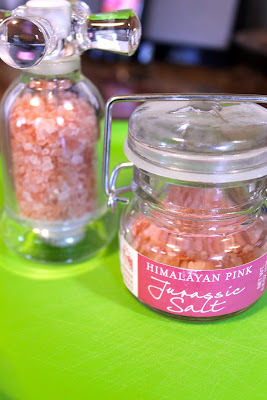 When I decided to write this blog post about my obsession with the pink salt, i figured I better do a little more research into what this stuff actually was. So a-digging I did go! Turns out this salt is mined in Pakistan and supposedly has all kinds of minerals in it that are good for your body. This salt is also supposed to be some of the purest salt on the planet earth as well as being unbleached...which is funny to think about your salt being bleached...gross, right? In my research, I kept seeing over and over again that table salt is really bad for you. So I looked up what the deal is between table salt and kosher salt because I haven't used table salt in a number of years, anyway. There is little difference between them, as it turns out, but for the fact that kosher salt doesn't contain as many additives as table salt, which is arguably a good thing. But back to the salt at hand--the Himalayan salt. Himalayan salt, while from Pakistan (which, honestly, the regions are really close, so....), is pretty to look at. It may or may not have those health benefits that are boasted (helping pH levels, sleep patterns, and even blood pressure), but it's easy on the eyes. I am a modern human. I may not have a ton of primitive instincts, but I know what I like to look at... so I'm gonna keep using this [pretty in pink] product and hope that it's purer than table salt, and making me sleep better. If it's not? Well that's okay too!! !